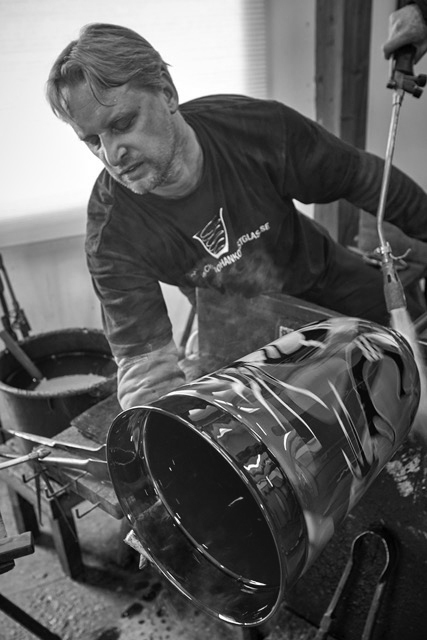 See guest artist Micke Johansson during live, narrated demonstrations in the Amphitheater Hot Shop November 8 through 10 from 10 am to 12 pm and 1 to 4 pm. Micke Johansson is a master glassblower and designer from Sweden. At 16 years old, Johansson started to work at Orrefors glassworks where he continued honing his craft for the next 15 years. He became a master glassblower at Orrefors at the age of 24. Johansson has been working from his own studio since 2007. From there, he produces all of his own glass designs. He focuses on glass techniques and specializes in "old Swedish" techniques like Ariel, Graal and the Swedish overlay.